Pip Stafford and Julia Drouhin in conversation with Norie Neumark. Art Talk is a series of conversation sessions designed to engage the public in discussions about the artists and their work. A mentor who has worked with the group facilitates the sessions. The discussions will be recorded and an archive will be made available online. Doing Feminism / Sharing the World explores participatory art practice and collective collaborations in a three-month program of artist residencies, artists' talks and a symposium. Its focus is on collaboration and participatory and public projects informed by a feminist ethics that addresses ‘sharing the world’. Doing Feminism / Sharing the World is generously supported by the Victorian College of the Arts, University of Melbourne, the Australian Research Council, the Australia Council for the Arts, Creative Victoria and the City of Melbourne. 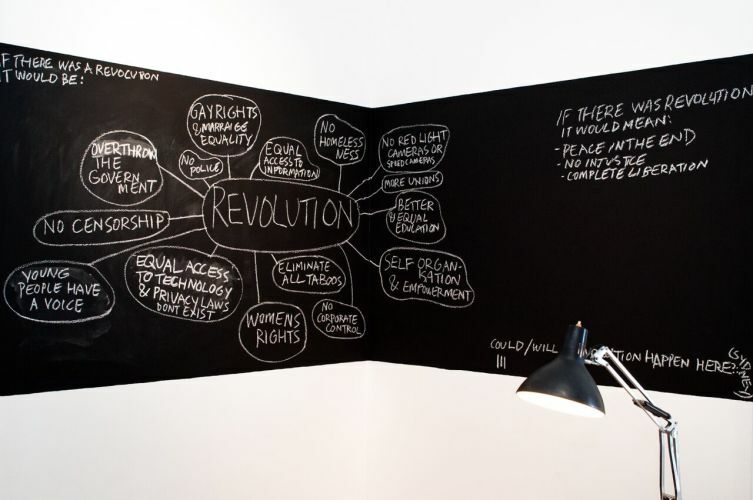 Image credit: 'Cold Calling a Revolution' by Kelly Doley (2014–15).